I could not remember when was the last time when I had my girls night out. Glad that I had the chance to enjoy girls night out, again after quite sometime. This round we know we get to enjoy Chandon wine tasting with our favourite high heels on! Well, it was day before I left for Hong Kong and Macau trip! We arrived there quite early and get to chit-chat with Glenn Thompson and get to know more about various Chandon wines! The first one - Chandon Brut - it was paired with fresh blueberries and popcorn. The Chandon Brut is straw yellow in colour with flashes of green and a fine persistent bead, crafted to create a fresh and elegant aperitif style wine, with a soft, generous palate and a crisp finish. Why blueberries? It is because the entry is soft with generous primary fruit characters followed by a creamy mid-palate offering nougat and nectarines extending to a lingering and crisp brut finish. Next up was the Chandon Rose - paired with Salmon Seaweed and Strawberries. Just so you know that the Chandon Rose is a fresh, vibrant and elegant which also enticing and distinctive it has a long, generous palate and a bright, crisp finish. Look at the pink peach skin with vibrant rose gold to light bronze hues colour of Chandon Rose, lovely. The entry is gentle and creamy with mouth-filling stone fruits, strawberry and vanilla ice cream characters, soft citrus tones keep the palate fresh and balanced. What I really love in Chandon Rose? It would be because the inclusion of a little red pinot noir base wine in the assemblage provides an extra layer of complexity, additional richness and persistence to the dry, crisp finish. Third, Domaine Chandon Chardonay 2010 - paired with Crayfish Risotto and Cherries. This certainly something interesting and special, the Domaine Chandon Chardonay 2010, the palate is focussed and bright, with almond nougat and cashew flavours adding further layers. The white peach and nectarine characters are layered with hints of dried figs on the nose. Yours truly quite loving this wine pairing moment. We then moving on with Domaine Chandon Shiraz 2010 - paired with Spice Lamb with Crumbs. The primary fruit aromas of warm berries, damson plum and dark cherry aromas all lead into a nose complex with mixed spice. The Shiraz 2010 has lively cinnamon, sandalwood and cardamom aromatics which lift the nose and add interesting complexity. It has a wonderful length of flavour and is spicy to the finish. It's either I just turned quite tipsy or it kinda strong to my liking, I wasn't really into this one. 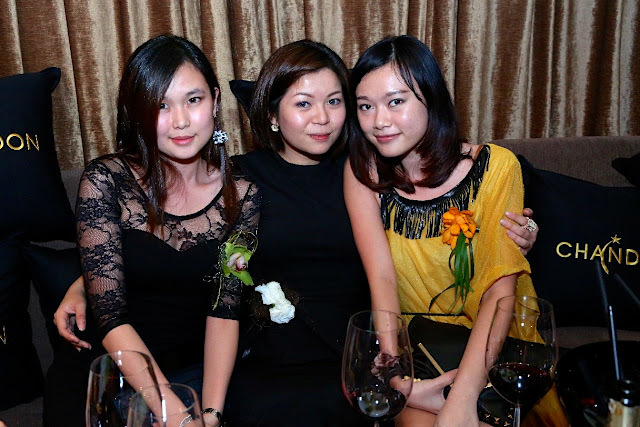 The girls' night out session wasn't just about wine tasting but also "Truth or Dare" game! Once the bottle spinned, someone had to choose whether to choose telling the truth on the question asked or dared to drink it off, Chandon of course. :p It was really REALLY fun getting to know other girls through this whole fun session.